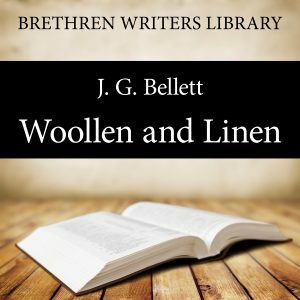 In Woollen and Linen, J. G. Bellett exhorts us to live our lives wholly for God. We are not to be found wearing garments of ‘woollen and linen’ or ‘divers sorts’ ie we are not to live with a mixture of Godly and wordly principles. In this challenging book we are exhorted to purity of heart and spirit. For our encouragement, JG Bellett draws examples from the lives of David and Abraham, who, despite failures, followed God according to His mind. Then by showing us the error of men such as Lot, Jonathan, Obadiah and Jehoshaphat he also warns us to beware of living lives inconsistent with the call of God. A word about the author: John Gifford Bellett (1795 –1864) was born in Dublin, Ireland. He was educated first at the Grammar School in Exeter, England, then at Trinity College Dublin, where he excelled in classics. Here he met and became a lifelong friend of John Nelson Darby. He was saved when he was a student and spent his life in the service of his Lord. Bellett wrote many articles and books on scriptural subjects, his most famous works being The Patriarchs, The Evangelists, The Minor Prophets and The Moral Glory of the Lord Jesus.